And yes, I was as ecstatically happy as I look in the picture. Total hog heaven, or sheep heaven, to be more accurate. Much of our chit-chat during the day involved the economics of this industry, as both of my friends who accompanied me are economists (and one is also a knitter). 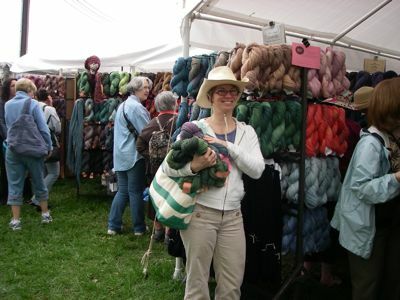 One reason why this event and others like it are so popular is that they provide access to small-batch, hand-dyed yarns that are not widely commercially available. For example, in the above picture I’m standing in front of the fabulous, wonderful offerings from Brooks Farm (and I dropped some serious cash there, as you can see from the pile in my arms). They only sell at festivals and online, not through bricks-and-mortar stores. The growth of the Internet, and of online social communities for knitters through blogs and Ravelry, a sort-of Facebook for knitters, has increased the demand for such distinctive fibers. Folks like Brooks Farm have seen their businesses grow as more people become aware of their products. 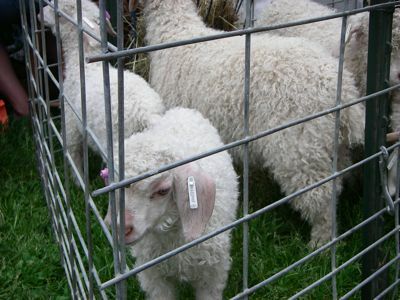 The evidence of this connection was very apparent at Maryland Sheep & Wool. I also enjoyed watching the feeder lamb auction, in which individual breeders (many of whom I saw were young, about 12-16) display a sheared lamb, and the auctioneer facilitates a single-price, ascending, open-outcry English auction. These lambs were going for around $150-200, which is high relative to the overall market average for feeder lambs in the U.S. markets. High quality, local lamb, some of which I had for lunch, and it was glorious.